This image shows the 1x1 Block Tunnel with a prototype installed. 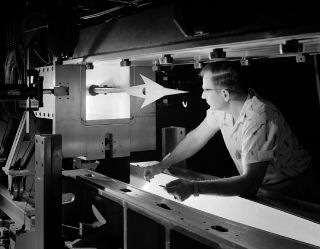 In this historical photo from the U.S. space agency, the 1x1 foot Block Tunnel is shown on Sept. 11, 1957, with a missile prototype model installation. These tests were performed at the Lewis Flight Propulsion Laboratory, now the John H. Glenn Research Center.